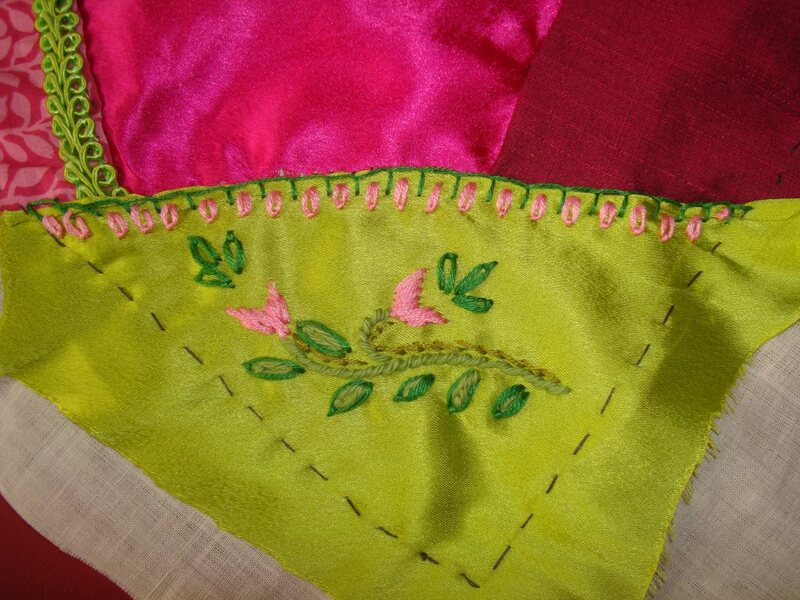 The working of this decorative stitch is on SharonB’ s Pintangle. This sampler is experiment in design and colours with appliqued paisley. After working the twisted lattice band, fly stitch, closed buttonhole stitches are worked in the bottom sample. Buttonhole stitches laced through the herringbone stitches and buttonhole stitch outline are worked in the top row. 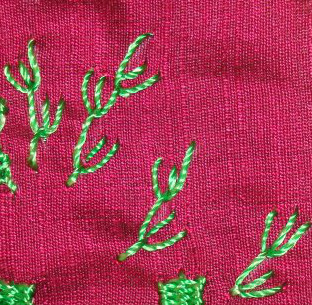 French knots, detached chains and long tailed chains [in fine silk thread] are worked with twisted lattice band filling stitch. This weekly challenge keeps me in line in working my projects. to see the projects of others visit Pintangle. I was working on my TAST piece till yesterday morning which did not allow me to work on other things. After a satisfying finish, I worked a little on the hussif. The floral spray is worked with rope stitch stems and straight stitch flowers. It was easier to choose the seam- twisted lattice band, but I need to practice this stitch, which is next week’s project. I was designing borders [with mirrors] for a tunic. The tunic colour is yellow [mango colour]. 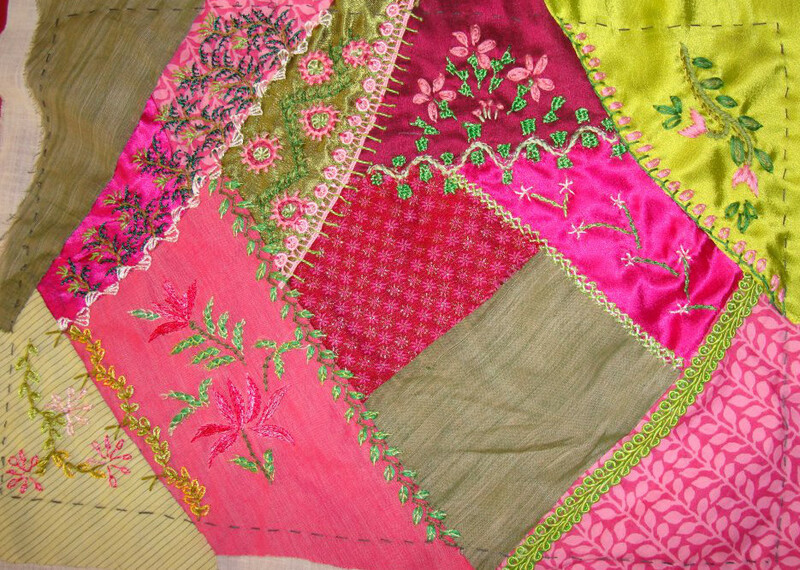 The borders are worked in green [the salwar colour] fabric. Both these fabrics are handloom cotton. A curve pattern was chosen and drawn with provision for round mirrors .Though the design itself may have been greek or Italian, mirrors will turn it into ethnic Indian design. I had seen mirror work borders which can be used for different purposes in shops. I using the same idea and working these borders for sleeves and tunic front. The space below the neck will have geometric kutchwork pattern. I have started with the main yellow. The curves are worked in herringbone filling. lots of repetitive work to do. Sigh! This post motivates me to work on projects that would otherwise would become UFOs. Visit pintangle to see how others have made progress on their projects. 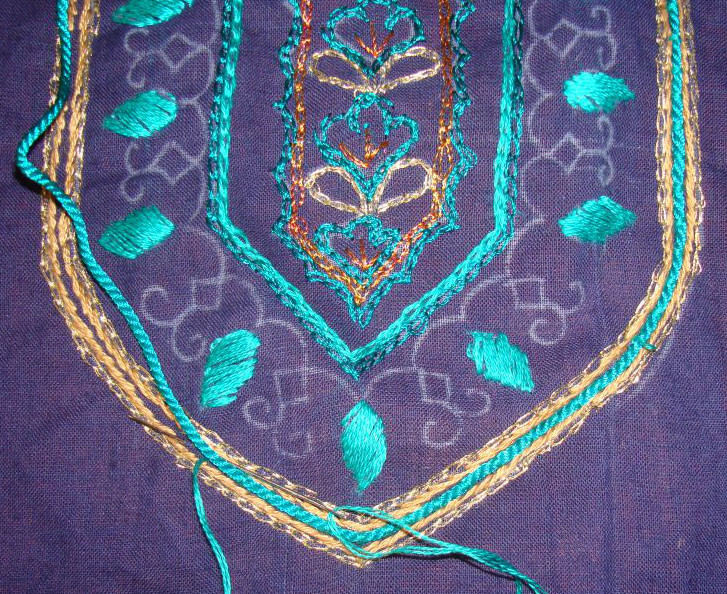 I am currently working on a tunic, which was completed and has been given to the tailor. The mirrors have helped in taking the attention from the white thread. 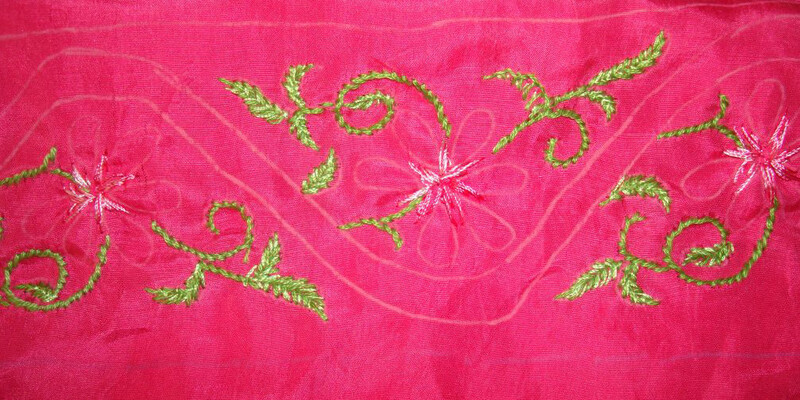 Initially it was not in the plan to use these bright colours, later felt this tunic would be very dull even with the embroidery and brought out the colours. 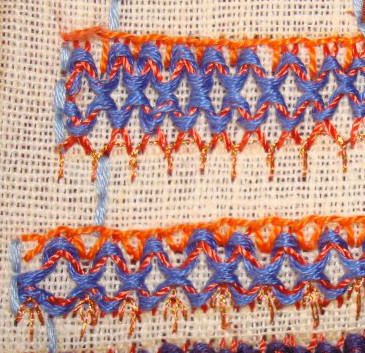 The stitch on TAST challenge this week is woven trellis. 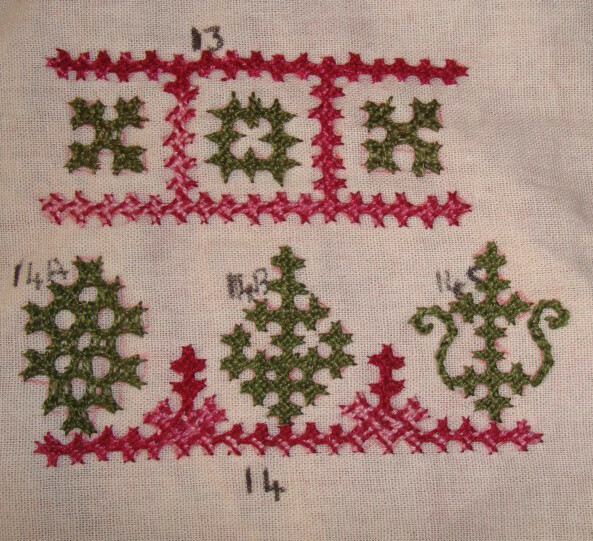 I had worked this stitch sampler on previous challenge. And yet to start on working on it this week. 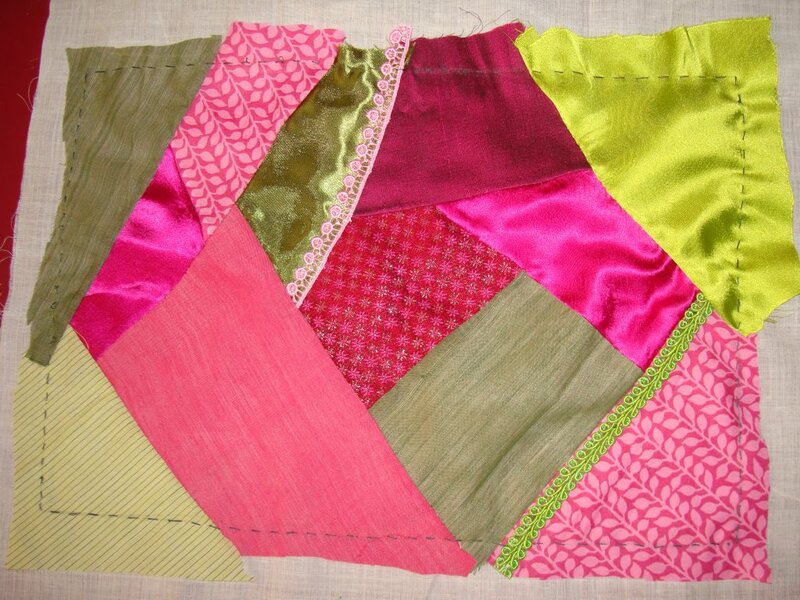 I was also looking for some leaf stitch other than detached chain on my crazy quilted hussif. I used this stitch on the seam along with stem stitch with two colours and metallic thread. As Sharon suggested, this polyester thread does not bring out the beauty of the stitch. I wanted to work this stitch on feather stitch. Straight stitches were worked on feather stitches. 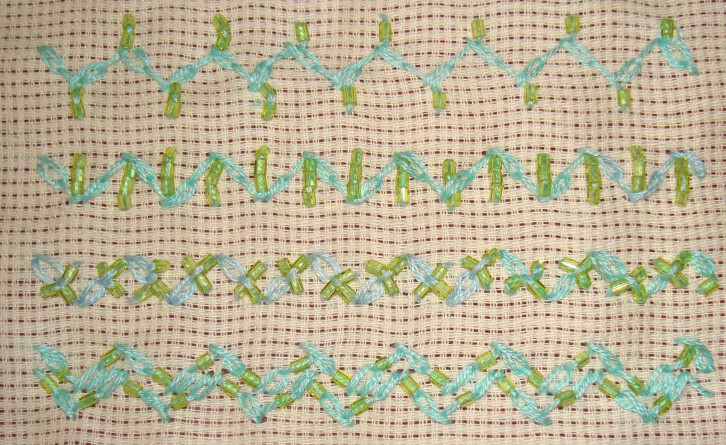 Woven trellis stitches were worked on these after that. 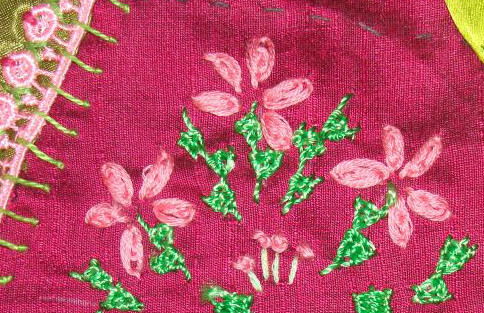 The flowers are worked with oyster stitch and french knots were added to the base. I have drawn a pattern for embroidery on tunic. It also has mirror worked borders, a simple border to incorporate the mirrors was also drawn this week. Now eager to see what others have been working on this week. 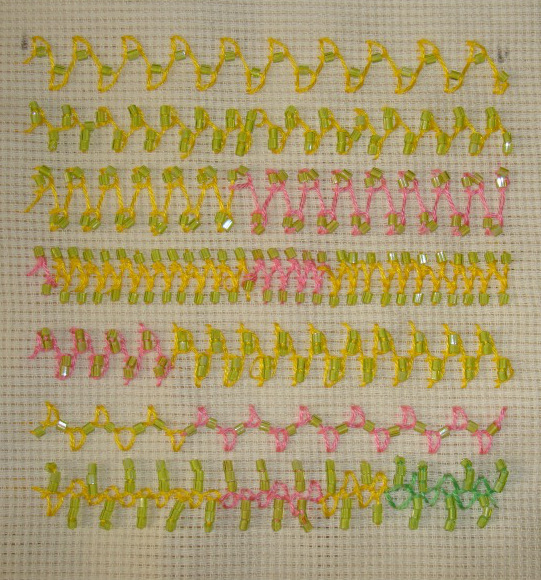 This week’s is beaded version of last week’s stitch. 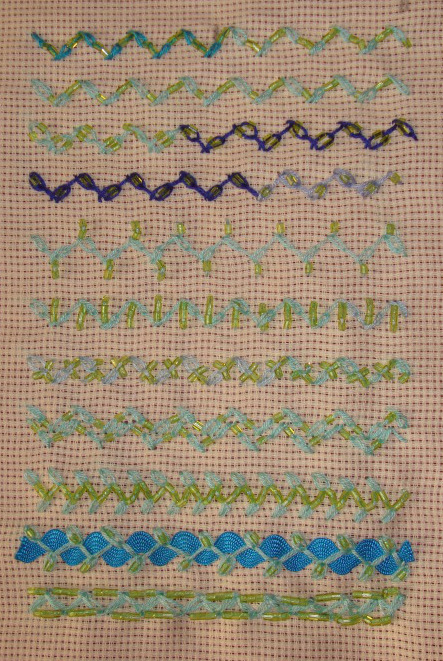 The working of this stitch is on SharonB’s blog. 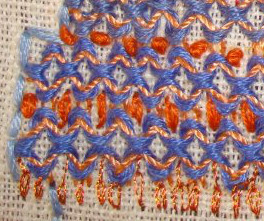 The beads are added at different parts of this stitch in these samples.